If you happen to find yourself in Paris between now and the middle of February, you simply must find time to visit a glittering collection of jewels that includes a number of important and familiar royal gems. The Grand Palais is currently hosting an exhibition on the work of Cartier, showcasing pieces from the nineteenth century alongside more contemporary creations. Among the 600 jewels in the exhibition, Cartier: Le Style et L'Histoire features a number of highly recognizable royal pieces. One of the most impressive is the sapphire pictured above. In the early 1920s, King Ferdinand of Romania purchased it from Cartier for his wife, Queen Marie. She wore the sapphire, which weighs more than 478 carats, to her coronation in 1922. The family probably sold the sapphire around 1947, when Marie's grandson, King Michael, was forced to abdicate. It has been auctioned several times in the decades since, and in 2003, Christie's sold the gem for almost $1.5 million . 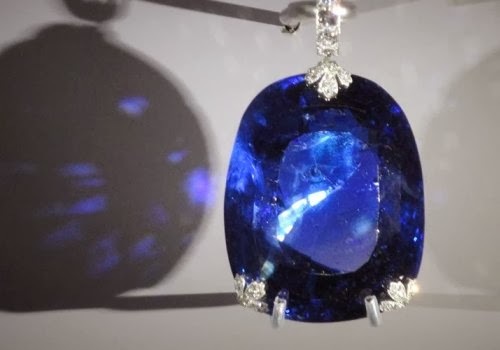 Joelle Diderich notes that this is the first time that the sapphire, which is often said to be one of the largest ever discovered, has ever been exhibited to the public . The pieces loaned to the exhibition by Queen Elizabeth II have been seen by the public on a much more regular basis. 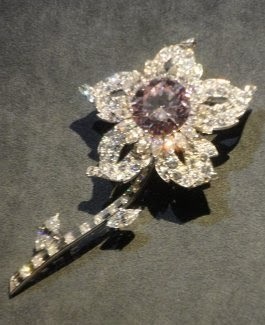 One is the phenomenal Williamson brooch (pictured at right), which features one of the most valuable pink diamonds in the world. The diamond, which weighs more than 23 carats, was given to the queen by John Williamson as a wedding present in 1947 . 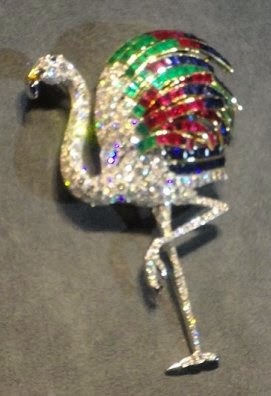 Cartier designed the brooch to complement the stone five years later. Unfortunately, Suzy Menkes says that the exhibit does not display the piece to its greatest effect, because the "low lighting does not do this rose pink stone justice" . The other piece loaned by Elizabeth to the exhibit is perhaps even more recognizable: it's the Halo tiara that the Duke of York (later George VI) purchased for his wife from Cartier in 1936. We know it better today as the Duchess of Cambridge's wedding tiara . The curators of this exhibition knew to capitalize on that famous connection; Kim Willsher explains, "To ensure its significance did not go unremarked, there was a framed photograph of Kate, Duchess of Cambridge, wearing the Halo diadem – 'something borrowed' from the Queen – at her wedding to Prince William in 2011" . But Kate's wedding tiara isn't the only diadem in the exhibition that has connections to royalty. Doulton reports that "one of the first cases displays a revolving carousel of diamond tiaras that shower out sparkles of light and revolve just slowly enough to take in their delicate grace," marveling that it makes the viewer feel like her or she is "standing pressed against the wall at a ball during the height of the Belle Époque" . One of these sparklers is the diamond and platinum bandeau (pictured above) acquired from Cartier by Queen Elisabeth of the Belgians in 1912. The tiara was worn by Elisabeth at several major royal occasions, including the weddings of her son and grandson. It was eventually sold back to Cartier by Princess Lilian, Elisabeth's daughter-in-law, in 1987 . And there are plenty of other tiaras with royal connections, too. The Essex tiara (pictured above), made for a countess and later worn by the wife of a prime minister (that'd be Lady Churchill) and a crown princess (Margarita of Romania), is on display . So are two tiaras from the collection of Marie Bonaparte, including her olive wreath tiara . As you might expect, there are a number of objects included in the exhibition that were worn by Princess Grace of Monaco. The Grimaldis have loaned Grace's engagement ring, an impressive diamond and platinum necklace, several animal brooches, and the three brooches that make up the Bains de Mer tiara . And another pair of famous royal Cartier customers, the Duke and Duchess of Windsor, are represented by several jewels. The duke's grandfather, Edward VII, famously dubbed Cartier "the jeweler of kings," and although David abandoned his throne, he continued to patronize the jeweler as if he were still a sovereign. Among the duchess's jewels on display are her famous flamingo brooch (pictured at right) and one of her diamond panthers, this one perched on an enormous cabochon sapphire. Jewels from other American collectors like Gloria Swanson, Elizabeth Taylor, and Barbara Hutton sparkle throughout as well. But it's a jewel that belonged to a male customer, not a woman, that perhaps steals the entire show. Cartier has loaned a restored version of the famous Patiala necklace (pictured at left) to the exhibition. 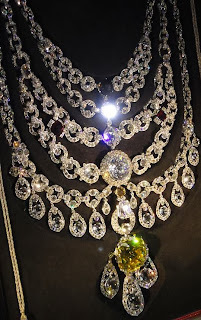 Ordered from Cartier in 1928 by Bhupinder Singh, the Maharaja of Patiala, this bib necklace originally featured the yellow De Beers diamond in its pendant element. 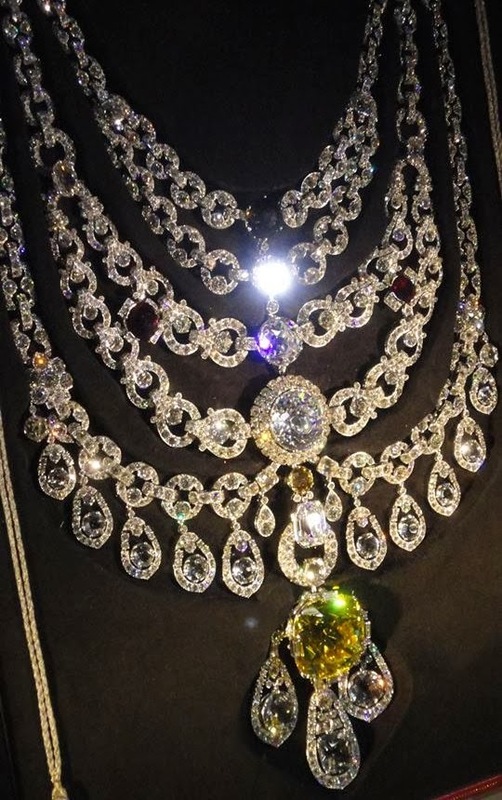 That diamond alone weighed more than 234 carats; the restored version of the necklace features a replica stone in its place (along with other replacement stones throughout). Doulton marvels that the "jaw-dropping" necklace, which features diamonds "the size of conkers," is able to be "seen from across the vast room" . The necklace was discovered in pieces in 1998, identified as Cartier, and restored. The exhibition is being held at the Grand Palais, located on the Avenue de Champs-Élysées, until February 16, though it is closed on Tuesdays. Much more is available at the exhibition's website. But if you, like me, can't make it to Paris to see these remarkable gems before the show closes in a few weeks, there's another alternative available. An iPad app, which features gorgeous, high-definition photos of many of the famous royal gems in the exhibition, is available for $3.99. Its text is in English, and it's quite a bit cheaper than a round-trip ticket to France! A note: special thanks to reader Nancy, who was lucky enough to visit the exhibition, for sending me the gorgeous photographs in this post and giving me permission to use them on the blog. Thank you so much! 1. Photograph taken by blog reader Nancy. Used with the kind permission of the photographer. Do not reproduce without the photographer's consent. 2. See New York Magazine's blog, The Cut, here. 3. See Women's Wear Daily's review of the Cartier exhibition here. 4. Photograph taken by blog reader Nancy. Used with the kind permission of the photographer. Do not reproduce without the photographer's consent. 5. In The Queen's Diamonds, Hugh Roberts states, "Dr Williamson presented the diamond (uncut and weighing 54.5 metric carats) to Princess Elizabeth" (pg. 294). See also Field, pg. 102, and the Royal Collection website. 6. See the New York Times review of the Cartier exhibition here. 7. 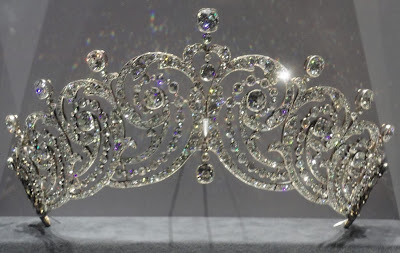 See more on the Halo tiara in this post at A Tiara a Day. 8. See the Guardian review of the Cartier exhibition here. 9. Photograph taken by blog reader Nancy. Used with the kind permission of the photographer. Do not reproduce without the photographer's consent. 10. See the Telegraph review of the Cartier exhibition here. 11. See more on the Cartier bandeau in this post at A Tiara a Day. 12. Photograph taken by blog reader Nancy. Used with the kind permission of the photographer. Do not reproduce without the photographer's consent. 13. See more on the Essex tiara in this post at A Tiara a Day. 14. See more on the olive wreath tiara in this post at A Tiara a Day. 15. See more on the Bains de Mer tiara in this post at A Tiara a Day. 16. Photograph taken by blog reader Nancy. Used with the kind permission of the photographer. Do not reproduce without the photographer's consent. 17. Photograph taken by blog reader Nancy. Used with the kind permission of the photographer. Do not reproduce without the photographer's consent. 18. See the Telegraph review of the Cartier exhibition here.